Four skilled skydiving women set a new Texas State Record head-up skydiving record at Skydive Spaceland last Saturday, Oct. 12, during the Jump for the Rose PinkFest Boogie. The annual charity event has so far this year raised more than $10,000 for The Rose, Houston-area breast cancer clinics that provide screening and treatment for women who can’t afford services along with those who can. Nicole Black, Merriah Eakins, Alexandra Neale, and Katrina Shows were the ladies who set the new record. “It’s so awesome for someone with 222 jumps to be asked to jump with amazing jumpers like Merriah and Kat and achieve something that two years ago seemed so far out of reach,” said Neale. The record jump was just one of many fun, rewarding skydives made by participants in the Jump for the Rose fundraiser. 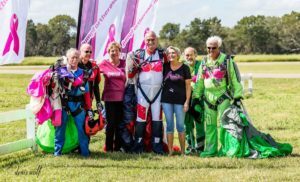 The annual breast cancer awareness event at Skydive Spaceland just south of Houston draws skydivers from around the world to raise money for The Rose and have fun trying to set skydiving records. When they weren’t setting records, participating skydivers enjoyed jump planning with top-quality skydiving organizers, wingsuit flights, children’s teddy bear and Barbie doll jumps, and more. This year’s event included participants from 18-75 years of age, hailing from eight states and two countries. In addition to the jumping, the event featured breast cancer prevention education, a popular raffle, a presentation of the skydiving/breast cancer documentary Pink Skies by producer Gulcin Gilbert. Eight cancer survivors attended, and the money raised brought Jump for the Rose’s lifetime donations to The Rose clinics to more than $50,000 (and donations are still coming in). · For more information on Jump for the Rose, or to donate see www.JumpfortheRose.org.